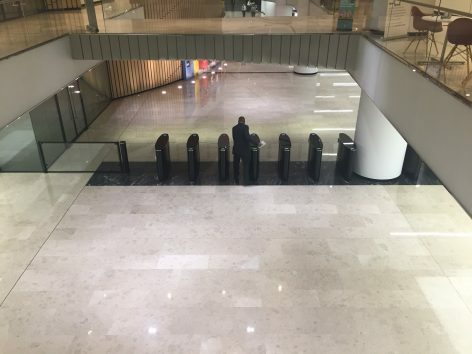 PRODUCT: EasyGate BG SECTOR: Grade A Office CLIENT: Financial Services Organisation LOCATION: London 5 Broadgate is a stunning new grade A office development built in the heart of London, as part of the regeneration of the Broadgate area. The building is the new London Headquarters of a Financial Services Organisation occupying 700,000 sq ft over 12 floors, and housing up to 6000 staff. Designed by Architectural firm Make this groundscraper is one of the largest stainless steel clad building’s in the world and represents a new standard for workplace and office design. Make based the building’s design on the form of a perfectly machined metal object, windows, courtyards and terraces are carved out just where they are needed – minimising the energy needed for cooling, heating and lighting, making 5 Broadgate one of the world’s greenest building’s. 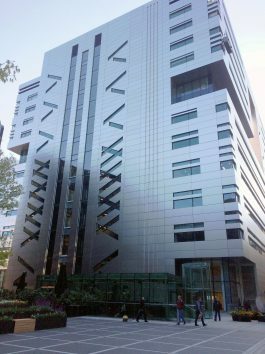 The facade is constructed from stainless steel panels, which unifies the surface, creates a strong visual impression and reflects the bespoke and innovative nature of the building. 5 Broadgate’s internal structure provides four large trading floors that can accommodate up to 3000 desks, with the addition of seven levels of offices. 5 Broadgate marks a pioneering move away from more traditional glass facades and is a new and exciting architectural era for Broadgate. For such an innovative and bespoke building, a unique security solution was also required. As specialists, in balancing security and aesthetics, Meesons designed a bespoke EasyGate BG speed gate which was in keeping with the building’s ultra-modern design. Due to the high level of throughput required the client requested a speed gate solution that would allow for quick transits, and was finished in a material that would be durable and withstand the high level of usage. 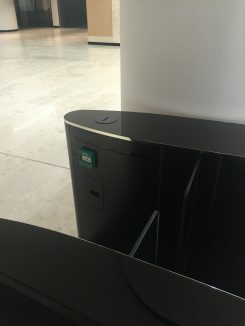 Meesons proposed the EasyGate BG due to its silent and smooth MDD motor drive, which enables the quick opening and closing of the glass barriers, and provided a black RAL finish to the cabinet with glass top lid to offer a more durable finish. Based upon the expected level of throughput, Meesons delivered the installation of 16 lanes in the main reception area to cope with throughput requirements and prevent queuing, particularly at peak times. 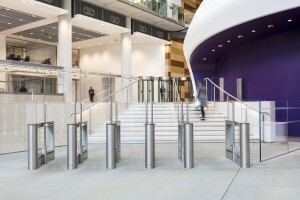 As with the building, an innovative and bespoke design was required for the speed gates. To improve the aesthetics of the EasyGate BG, Meesons provided a bespoke 15mm stainless steel trim to wrap around the top of the speed gate, which not only ensured that the BG would stand out as a focal point, but also creating a seamless finish between the cabinet and the glass top lid. A visitor card collector and a break glass unit were also specified and integrated into the cabinet to create a sleek and aesthetically pleasing solution. The end result was a stunning, bespoke speed gate installation. 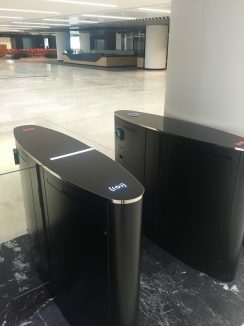 Following the successful handover of the project to the building’s management team, Meesons were appointed to handle the service and maintenance of the speed gates. 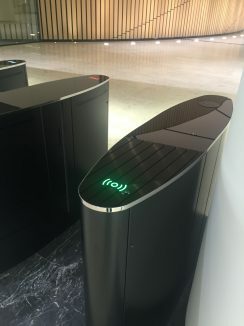 Since the installation was completed thousands of users pass through the speed gates on a daily basis. Comments from the client: “Given the innovative and bespoke nature of the building, we required a speed gate installation that was equally bespoke. As a specialist at providing bespoke speed gate solutions, Meesons worked with us throughout the development to deliver secure access that met all our requirements” “We are delighted with the speed gates, they have been highly reliable and have more than coped with the high level of throughput we experience on a daily basis. The low power consumption of the speed gates ties in well with our sustainable and energy efficient vision for 5 Broadgate. Meesons have succeeded in delivering a bespoke speed gate solution that delivers on both security and aesthetics”.